 Graduating in 2019? We have on trend styles arriving now!  The next Second Saturday in Uptowne Olds is on April 13. Our theme: April Foods Day!  Spring Stock arriving daily!  Planning a wedding this year? 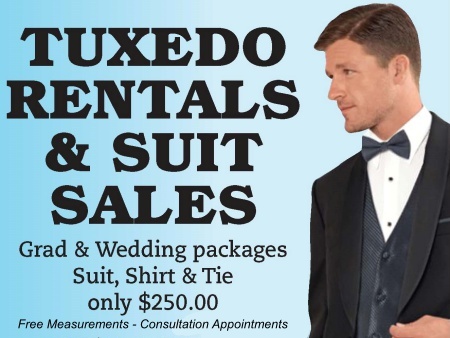 We have hundreds of different options from super formal to country casual.  We do in-house alterations! For the perfect fit on your suit or getting those jeans to just the right length.  We are a depot for Country Fresh Dry Cleaners out of Three Hills!